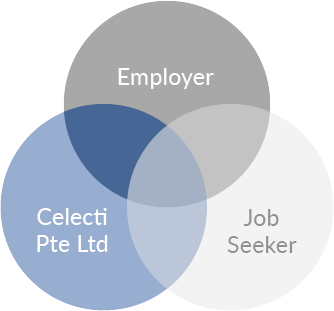 In CELECTI, we embark on a collaborative approach and transparent processes in helping you to get the right fit. We help corporations overcome intense competition and volatile business environments by working closely with Clients to identify their underlying needs before making any recommendation. We recognize that companies seek professional services, responsiveness, quality, variety and reasonable premiums in getting the right fit. We believe that people shape the organization’s success and have higher chance to succeed in the right environment. That’s why in CELECTI, we are committed to upholding accountability and transparency in all our business dealings with employees and with clients. We assure recruiting needs are fully met. In other words, we will not fit a rectangular peg into a round hole. Our collaborative approach will assure you that recruiting needs are provided timely, efficiently and adequately.